Blogging has earned me quite number of friends whom share the same ideas/thoughts/ interests as me. Reshmi of Easy Cook is one such wonderful friend. Facebook has also contributed a lot in growing this friendship, where we chat almost everyday till midnight. I can talk to her about Foodgawker and tastespotting, which is greek and latin to even my husband, also regarding anything else on earth she immediately understands what I exactly mean. So when I asked her to do a guest post for me, she immediately agreed to it. She has prepared a wonderful kheer with quinoa and here she is with the post. Over to Reshmi.. Though I started blogging long back I was never too much into it..or I was not consistent with it.....There would be many reasons for that..With all these problems I have never had great friends too in this world...Those whom I meet joins me for some time..then I post after 1 or 2 months..they wud have gone ..I get new people again..ya I miss my previous friends but they never remember me and so I am forced to move on..:(..This was the case until I started my fb account...hey doesn't mean that things changed now..;) but I got to get some real friends with same thoughts and deeds...hoping that they wont leave me on the go...:)..
Wash quinoa thoroughly under water, drain and set aside. Heat water and add quinoa into it.Cook covered on medium low heat till quinoa is cooked. ie the white thread(germ) comes out.Do stir in between cooking. Drain if any excess water is there. Boil the milk in a vessel and when it boils add the cooked quinoa to it and cook for 5 minutes. Do stir in between. Now add the sugar into it and continue cooking till the milk reduces and payasam forms slightly thick. The payasam tends to thicken while cooling.So keep that in mind while reducing the milk. Take off the heat and cool it. Now add the rose syrup and give it a good stir so that it mixes well. Garnish with toasted almonds and serve at room temperature or chilled. Rose syrup has sugar in it, so add sugar accordingly. You can use condensed milk to thicken the payasam in that case add it after the 5 mins of cooking quinoa in milk. Reduce the milk to 1 and 1/2 cup in this case.Also avoid rose syrup. Since rose syrup has a lovely smell and flavor, cardamom, ghee etc are not added here. You can add them, if avoiding rose syrup. Keep stirring the payasam to avoid burned milk at the bottom of the vessel. Add more rose syrup if u feel that you want a deep rose color. 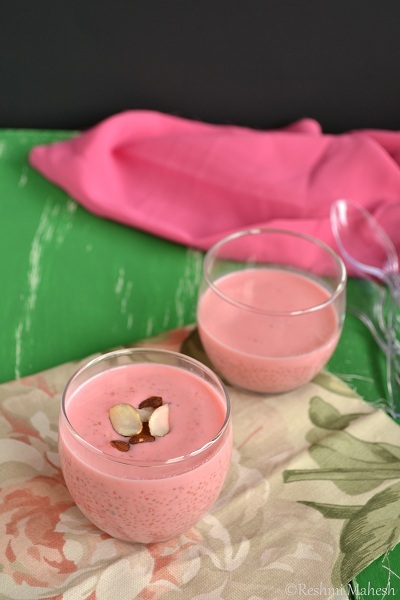 Grt guest post..love the clicks and the colour of the payasam ! 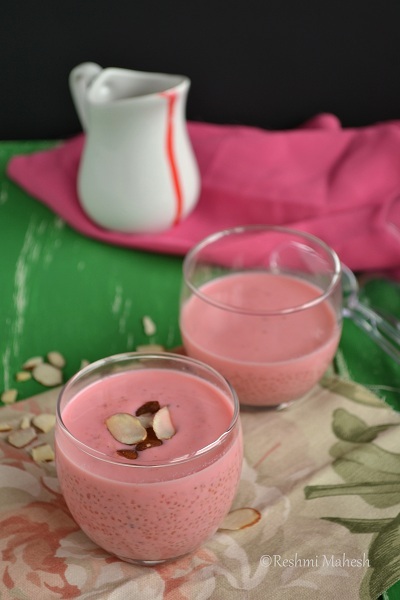 Mouthwatering recipe.I always love such healthy kheers..Truly worth it. 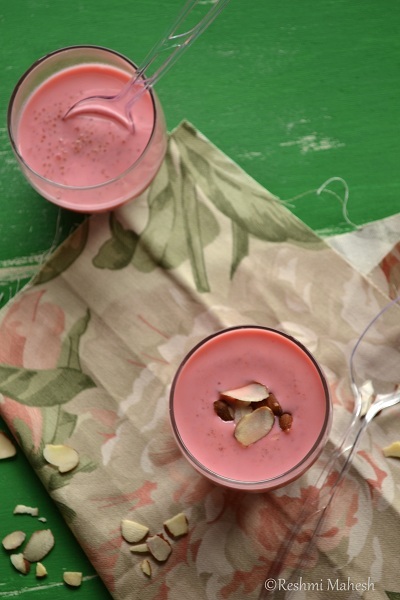 Great guest post,the color is so beautiful and also the flavors,yummy payasam. Delicious payasam. love that click. Nice yummy payasam..I loved the unique kheer and color it has come up with.Long live the friendships ! Thanks for sharing this Divya and Reshmi. healthy Payasam and loved the color. I like the way Reshmi Mahesh introduced you. Friends make you feel good. I am totally fine with whatever time I spend on blogging and have kept few blogger friends just like you. Nice take on quinoa by Reshmi! 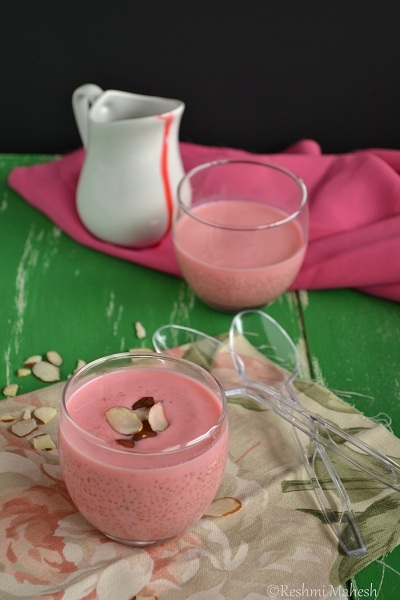 Thats a fabulous guest post by Reshmi, love here that rose syrup touch.Inviting kheer. Very interesting recipe! Looks so yummmmmm!